Ford Motor Company has filed an application to register B-MAX as a trademark with the United States Patent and Trademark Office (USPTO), Ford Authority has discovered. Ford sells a subcompact people mover (MPV) called the B-MAX in various international markets such as Europe. Built on the same Ford global B platform as the Fiesta and EcoSport, the B-MAX is driven by the front wheels and features a sliding rear door and two rows of seating. 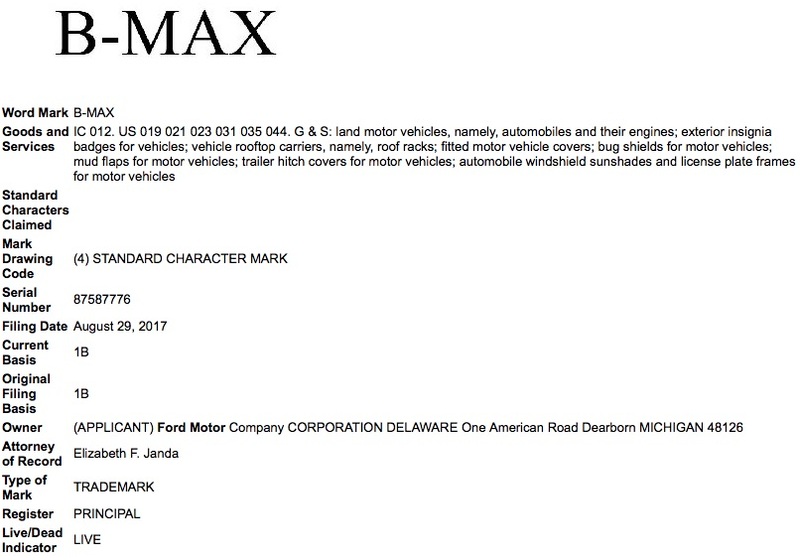 As such, this filing would suggest that Ford could be planning to bring the B-MAX to the United States market to join the larger C-MAX. The move makes sense given The Blue Oval’s drive to globalize its lineup if not for the fact that the B-MAX is reportedly set to be discontinued later this year. As such, this filing could simply be a reflection of FoMoCo taking steps to secure the trademark while it has a product with the B-Max name, since having a real-world product or service with the name being applied for is a pre-requiriste of being granted rights to a trademark. Stay tuned as we follow this topic. In the meantime, check out out Ford B-MAX news and other Ford news right here at Ford Authority. Maybe Ford might be using the B-MAX to compete with the Chrysler Pacifica.